Paul, Stella. Chromaphilia: The Story of Colour in Art. London: Phaidon Press, 2017, pp. 147-148, illustrated. Art + NYC: A Complete Guide to New York City Art and Artists. New York: Museyon Inc, 2016, p. 97. Saunders, Richard H. American Faces: A Cultural History of Portraiture and Identity. China: University Press of New England, 2016, p. 87. Holzwarth, Hans Werner. Koons. Cologne: Taschen, 2015, pp. 46-47. Asian Art Museum. Gorgeous. Exh. cat., San Francisco: Asian Art Museum/SFMoMA, 2014, pp. 16, 26, 33. Aurélie, Romanacce. “Jeff Koons: Le Roi Midas.” Arts Magazine December 2014, cover image, p. 109. Biesenbach, Klaus. Henry Darger. Munich: Prestel, 2014, p. 20. Bindman, David and Henry Louis Gates, Jr., eds. The Image of the Black in Western Art The Twentieth Century: The Rise of the Black Artists. Italy: The President and Fellows of Harvard College, 2014, pp. 260-261. Champion, Julie and Caroline Edde. Jeff Koons: La Retrospective: The Album of the Exhibition. Exh. cat., Belgium: Centre Pompidou, 2014, p. 29. Champion, Julie and Nicolas Liucci-Goutnikov. Jeff Koons: La Retrospective: The Portfolio of the Exhibition. France: Centre Pompidou, 2014, pp. 82-83. Prat, Véronique. “Jeff Koons avec ses millions, il achète de Manet.” Le Figaro 29 November 2014, p. 52. Koons, Jeff and Norman Rosenthal. Jeff Koons: Entretiens avec Norman Rosenthal. Hove, England: Thames & Hudson, 2014, p. 141 [French Edition]. Koons, Jeff and Norman Rosenthal. Jeff Koons: Conversations with Norman Rosenthal. China: Thames & Hudson, 2014, p. 141 [English Edition]. Lavrador, Judicaël. “Jeff Koons: génie ou imposteur?” Beaux Arts editions November 2014, pp. 134-135. Moderna Museet. Sculpture After Sculpture: Fritsch / Koons / Ray. Exh. cat., Ostfildern: Hatje Cantz, 2014 [Texts by Jack Bankowsky, Thomas E. Crow, Nicholas Cullinan, Made Great, conversation between Michael Fried, Isabelle Graw, Michelle Kuo, Charles Ray, Scott Rothkopf], inside cover page, p. 27. Sterckx, Pierre. “Quand Jeff Koons euphorise l’art.” Beaux Arts editions December 2014, pp. 44-45. Guiot, Nathalie. Conversations Artists and Collectors. France: Black Jack Editions, November 2013, p. 152-173. Bouvier, Raphaël. Jeff Koons - Der Künstler als Täufer. Munich: Wilhelm Fink Verlag, 2012, p. 251 (pl. 16). Campbell, Naomi. "Jeff Koons." Interview [Germany] November 2012, p. 102. Fondation Beyeler. What is Art? 27 Questions, 27 Answers. Basel: Hatje Cantz, 2012, cover. Gärtner, Barbara. “Summer of Jeff.” Architectural Digest [Germany] July/August 2012, p. 97. Getlein, Mark. Living with Art. McGraw-Hill Humanities/Social Sciences/Languages, 10th ed., 2012, p. 244. Obrist, Hans Ulrich. The Conversation Series 22 : Jeff Koons. Cologne: Verlag der Buchhandlung Walther König, 2012, p. 41. "Ab ins All!" Monopol March 2011. Bruck, Connie. "Broad's Way." Monopol April 2011, p. 52, illustrated in color. Dagen, Philippe, Françoise Hamon, and Jean-Baptiste Minnaert. Epoque Contemporaine XIXe - XXIe Siècle. Paris: Flammarion, 2011, p. 578, illustrated in color. Fondazione Prada. Ca' Corner Della Regina. Milan: Progetto Prada Arte, 2011, pp. 38, 221, illustrated in color. “Jeff Koons: Winter Bears.” Christie’s A Private View January 2011, p. 127, illustrated in color. Puente, Maria. “Baby Boomers helped democratize art.” USA Today 1 January 2011, illustrated in color. Bonami, Francesco. Dal Partenone Al Panettone. Milan: Electa, 2010, illustrated in color, p. 138. Skin Fruit: Selections from the Dakis Joannou Collection [curated by Jeff Koons]. New York: New Museum, 2010, p. 14, 144, illustrated in color. Vogue Nippon: Gioiello [insert magazine] Spring 2010, p. 28, illustrated in color. Bishop, Jane, Corey Keller, Sarah Roberts, ed. San Francisco Museum of Modern Art: 75 Years of Looking Forward. San Francisco, 2009, pl. 244, pp. 414, 433, 434 illustrated in color. Jones, Jonathan. "Opportunist or moral satirist?" The Guardian Weekly 31 July 2009, p. 34, illustrated in color. Jones, Jonathan. "Not just the king of kitsch." The Guardian 30 June 2009, pp. 6-7, illustrated in color. Lageira, Jacinto. "Celebration's Deception" Esse: Arts & Opinions (vol. 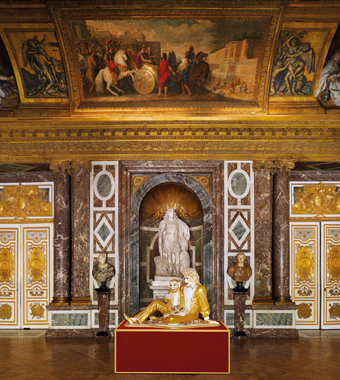 67) Fall 2009, p. 9, illustrated in color (installation view, Château de Versailles, Versailles, 2008). Mendl, Hans and Marcus Schiefer Ferrari, eds. Religion vernetzt. Munich 2009, p. 15, illustrated in color. Obrist, Hans Ulrich. Jeff Koons: The Conversation Series. Germany: Verlag der Buchhandlung Walther Konig, 2009 [First draft], p. 39. "What's On 12/2009." The Art Newspaper (no. 208) December 2009, p. 68, illustrated in color. Ward, Ossian. "Hello sailor!" Time Out London 2 July 2009, p. 22, illustrated in color. Cecchini, "Jeff Koons: La estetizacion del consumismo." Textofilia (no. 17) [Mexico] 2008, p. 58, illustrated in color. Holzwarth, Hans Werner, ed. Jeff Koons. Cologne 2008, pp. 290-291, illustrated in color (installation view). Houellebecq, Michael. "Jeff Koons." Art World (issue 7) October/November 2008, p. 33, illustrated in color (installation view, Château de Versailles, Versailles, 2008). Le Figaro. 11 September 2008, p. 1, illustrated in color. Nadeau, Barbie. "The Vatican Breaks Its Da Vinci Code." Newsweek Magazine 22 September 2008, p. 71, illustrated in color. Nakamura, Marie-Pierre. "USA: Jeff Koons." Art Actuel (no. 57) July/August 2008, p. 73, illustrated in color. Pincus-Witten, Robert. “Passages: the Eyes Had It.” Artforum January 2008, pp. 89-92. Chan, Paul. “Fearless Symmetry.” ARTFORUM March 2007, p. 264. Koons, Jeff, ed. “Jeff Koons Profile, Head to Head with Stella McCartney, Artwork.” Wallpaper October 2007. Landi, Ann. “How Jeff Koons Became a Superstar: Kelly Devine Thomas tracked the way an artist shaped his own career (Top Ten).” ARTnews November 2007, p. 187, illustrated in color. LeQueux, Emmanuelle. "Marche de l'art: l'annee de tous les records" BC/BE Contemporary Autumn 2007, p. 48, illustrated in color. Seymour, Stephanie. “Jeff Koons: Art Made in Heaven.” Whitewall Fall 2007, p. 140, illustrated in color. Utz, Philip. “Catching up with Jeff Koons.” Numero (no. 6) [Tokyo] September 2007, p. 69, illustrated in color. Walsh, Daniella. “Jeff Koons: On Track.” Art & Living (no. 7) Summer 2007, p. 46, illustrated in color. Tae-Woo, Hur. “Jeff Koons: An artist who made banality blue chip.” Asiana May 2007, p. 4. “The Artist’s Who Still Matter: Twenty Living, Working New Yorkers Whose Art Changed Art.” New York Magazine 15 October 2007. Canarutto, Sarah Cosulich. Jeff Koons (Supercontemporanea series). Milan, 2006, pp. 56-57, illustrated in color. Lacayo, Richard. “How Does the 80s Art Look Now?” Time 28 March 2005, pp. 59-60, illustrated. Thomas, Kelly Devine. “The Selling of Jeff Koons.” Art News (104, no. 5) May 2005, p. 118, illustrated in color. Jeff Koons: Highlights of 25 Years. Exh. cat., New York: C&M Arts, 2004, p. 72, 73, 83. Woltmann, Marit, ed. Jeff Koons Retrospektiv. Oslo: Astrup Fearnley Museet for Moderne Kunst, 2004, p. 86. Jeff Koons. Exh. cat., Naples: Museo Archeologico Nazionale, 2003, p. 65, illustrated in color. Jeff Koons: Pictures 1980 - 2002. Exh. cat., Kunsthaus Bielefeld, 2002, p. 23 (pl. v), illustrated in color (installation view). Museum of Fine Arts Boston Preview September/October 2002, p. 13. Shortcuts from the Dakis Joannou Collection. Exh. cat., Greece: DESTE Foundation for Contemporary Art, 2002, pp. 26 (detail), 39 (installation view, Athens School of Fine Arts, Athens, 1996), p. 56-57 (installation view, DESTE Foundation, Athens, 2000), 61 (installation view, DESTE Foundation, Athens, 2000). Wagner, Anselm. "Einfach ubertrieben." Frame January-March 2002, p. 81, illustrated in color. Jeff Koons: Easyfun-Etheral. Exh. cat., Berlin: Deutsche Guggenheim, 2000, p. 38 (fig. 19), illustrated in color. Kuspit, Donald. Redeeming Art: Critical Reveries (Aesthetics Today). New York: Allworth Press, 2000, p. 160, illustrated. Rosenthal, Norman and Michael Archer. Apocalypse: Beauty & Horror in Contemporary Art. London 2000, p. 232, illustrated. Sischy, Ingrid. “Koons, High and Low.” Vanity Fair March 2000, p. 271, illustrated in color. Saltz, Lizzie Zucker. “Manufacturing Validity.” Art Papers July/August 1999, p. 29, illustrated in color. Sokolowski, Thomas. “The Century’s 25 Most Influential Artists: Pop Star.” Art News May 1999, p. 151, illustrated in color. Collings, Matthew. It Hurts: New York Art from Warhol to Now. London 1998, p. 52, illustrated in color. Carson, Tom. “The Big Picture.” Village Voice 17 June 1997, p. 53. Gallo, Ruben. “Violencia [interview with Hal Foster].” Trans 1997, pp. 42-43, illustrated. Like Art Itself, Duane Hanson, Saatchi Gallery. Exh. cat., London: Saatchi Gallery, 1997, p. 9, illustrated in color. Caldwell, John. This is About Who We Are: The Collected Writings of John Caldwell. San Francisco 1996, p. 204, illustrated. Weintraub, Linda. Art on the Edge and Over: Searching for Art’s Meaning in Contemporary Society 1970s-1990s. Hong Kong 1996, p. 197, illustrated. It's Only Rock and Roll: Rock and Roll Currents in Contemporary Art. Exh. cat., Phoenix Museum of Art, 1995, p. 65, illustrated. Beye, Prof. Dr. P., Dr. W. A. Lbeeren and J. E. Sorensen, eds. Jeff Koons. Exh. cat., Amsterdam, Netherlands: Stedelijk Museum, 1993 [Texts by Wim Beeren, Gudrun Inboden, and Peter Schjeldahl], p. 61. Sørensen, Jens Erik & Anders Kold, ed. Jeff Koons Retrospektiv. Exh. cat., Århus: Aarhus Kunstmuseum Denmark, 1993, p. 59. "Kitsch As Koons Can." Prinz magazine May 1993, p. 144, illustrated in color. “In Short, Non Fiction: The Jeff Koons Handbook.” Entertainment Weekly 12 February 1993, p. 51, illustrated in color. Kramer, Hilton. “Despite Fracas over Safer’s 60 Minutes Segment, Koons Still Undefended.” New York Observer 18 October 1993, p. 23, illustrated. “Jeff Koons.” Diva June 1993, pp. 36-38, illustrated. Kammerling, Christian. “Umarmt eure Vergangenheit” Suddeutsche Zeitung (no. 46) 13 November 1992, illustrated on the cover and pp. 32-34, 36 (installation view). Albig, Jorg-Uwe. “Jeff Koons, ein Prophet der inneren Leere.” Art-Das Kunstmagazin (no. 12) December 1992, p. 56, illustrated in color. Koons, Jeff. The Jeff Koons Handbook. London: Anthony d’Offay Gallery, 1992, pp. 108-109, illustrated in color. Muthesius, Angelika, ed. Jeff Koons. Cologne 1992, pp. 116-117 (pl. 19), illustrated in color. “Was ist Kunst?” Buxtehuder Tagblatt 3 March 1992, p. 1, illustrated. "Fräls oss i vår banalitet" Konstnären March 1991, p. 7, illustrated in color. Dennisuk, William. “Jeff Koons.” Tiade (no. 2) June 1991, p. 1, illustrated. Kutner, Janet. “San Francisco joins the Art Race.” The Dallas Morning News 30 May 1991, p. 1, illustrated. Rainer, Arnulf. Primaten 1 April 1991, p. 1, illustrated. de Zwaann, Nelly. “Pop-Art: Noem je dat kunst?” Cosmopolitan 1 April 1991, pp. 68-71, illustrated in color. Bonetti, David. “SFMOMA has a Serious Change of Art.” San Francisco Examiner-Chronicle 1 March 1991, pp. 1-2, illustrated. “Design Notebook” Mirabella 1 January 1991, p. 58, illustrated in color. Depondt, Paul. “Beeldende kunst heft last van burengerucht.” Volksrant December 1990, p. 1, illustrated. Schjeldahl, Peter. “Rembrandt: Jeff Koons – Ja Kaikki Muut.” Taide (no. 6) December 1990, p. 23, illustrated. Barricklow, Denise. “Jeff Koons” The Face December 1990, pp. 104-108, illustrated. “Gaukler unter sich.” Hamburger Abendblatt 11 November 1990, p. 1, illustrated. “Der Kunstler Jeff Koons.” Ostholsteiner Anzeiger 23 November 1990, p. 1, illustrated. 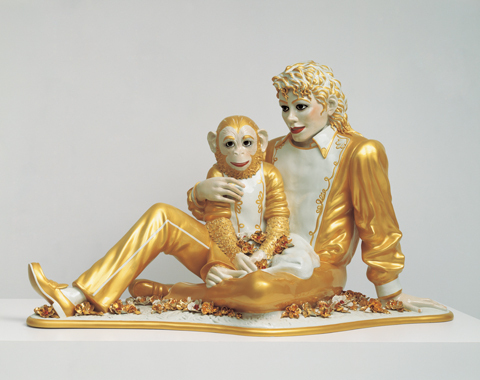 “Jeff Koons” Weitersehen 18 November 1990, pp. 107-113, illustrated. Ammann, Rene. “Die Kunst, Kunst und Kitsch zu verkitten.” SonnatgsZeitung 11 November 1990, p. 41, illustrated. Faust, Wolfgang Max. “Kunst mit Kitsch: Aufstand gegen den guten Geschmack.” Art-Das Kunstmagazin September 1990, cover, pp. 34-35, illustrated in color. Renton, Andrew. Jeff Koons and the Art of the Deal: Marketing (as) Sculpture. Performance (no. 61) September 1990, p. 21, illustrated. “Jeff Koons.” Reconnaissance 5 May 1990, p. 1, illustrated. Caldwell, John. A Generation. New York, 1990, p. 17, illustrated. Kimmelman, Michael. “Which Way for the Whitney.” The New York Times 18 February 1990, p. 35, illustrated (installation view, Whitney Museum of American Art, New York, 1989). Renton, Andew. “Super Star.” Blitz 1 January 1990, p. 52-59, illustrated in color. “Kitsch jenseits von Gut und Bose” Art-Das Kunstmagazin (no. 9) September 1990, cover (detail), pp. 34-35, illustrated in color. Kertess, Klaus. “BAD” Parkett (no. 19) Zurich 1989, p. 36, illustrated in color. Albig, Jorg-Uwe. “Koons kitschiger Zombie Zoo.” Stern 21 December 1989, p. 111, illustrated in color. “Leute von Morgen” Bunte 20 July 1989, p. 6, illustrated. Lacayo, Richard. “Jeff Koons.” People Magazine 8 June 1989, p. 128, illustrated in color. Morgan, Stuart. “Jeff Koons Fun.” Artscribe March 1989, p. 49, illustrated in color. Berman, Ann. “Jeff Koons Resume.” Avenue February 1989, p. 114, illustrated. Levin, Kim. “The Evil of Banality.” Village Voice 20 December 1988, p. 115, illustrated. Kramer, Hilton. “Koons Show.” New York Observer 19 December 1988, p. 11, illustrated. Brenson, Michael. “Greed Plus Glitz with a Dallop of Innocence.” The New York Times 18 December 1988, p. 41, illustrated. Zaya, Octavio. “Sabre Jeff Koons y los signos de nuestre tiempo.” Balcon October 1988, p. 55, illustrated in color. Carslen, Peter. “Jeff Koons.” Contemporanea (vol. 1) September–October 1988, p. 41, (original clay model) illustrated in color.